With so much discussion and writing about opioid addiction, I’m baffled by seeing nothing about actually addressing the causes of the pain. Articles are all about the misuse of prescription drugs by patients and doctors who prescribe them. Sure we all need pain-killers sometime, but not as a long-term fix for pain. They’re meant to alleviate the pain while we find a way to correct what’s causing it. Yet Western medicine tends toward suppressing symptoms with drugs, instead of seeking genuine remedies. Nonetheless, people in pain find us, the non-licensed, non-conventional body therapists. In my 3 decades of practice, I’ve learned that providing drug-free pain relief is easy. Pain release for the long term is fairly easy too. As an Ortho-Bionomist, I use my hands, attention, and verbal and sensory feedback from the client. Initially my goal is to create a comfortable position for the client, or to at least diminish the pain. Then the client feels tended to, feels relief, very similar to that of a scared child finally being held. And then something profound happens as the body relaxes: the bio-intelligence and innate healing reflexes take over. Pain relief deepens into tension patterns releasing, tissues normalize, circulation of all the fluids improves, function and balance return. So does inner peace. That previously scared child, feeling good again, wriggles free of the caring arms to go play with her friends again. 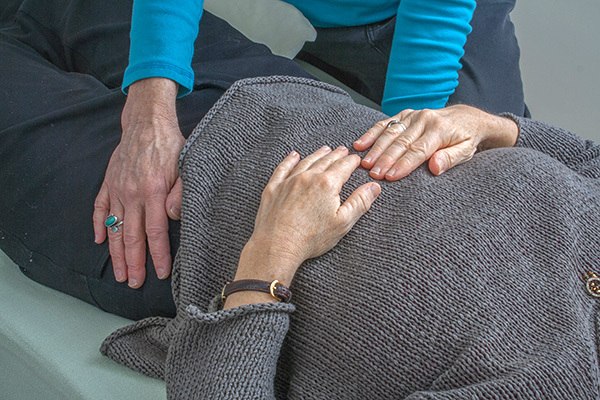 The client gets up from the table feeling better: pain has decreased, ease and range of motion increased, deep relaxation and revitalization happen from the inside out. By the time someone has been prescribed opioids, the pain is awfully bad and takes time to heal, for sure. But if one session can provide a couple hours of ease, it’s an excellent start. Session by session, the body heals another layer, integrates the “lesson,” and positive, affirming results last longer and longer, setting up a positive feedback loop. Resilience is re-established. The body truly knows how to heal itself when given the opportunity, when listened to and supported. My brother’s mechanic in rural California, also a hunter, pointed to a deer skull on his wall. “See that?” he said, “The deer had quite the blow to its head, perhaps from a collision with a car. And it healed itself. We used to know how to heal ourselves, too, but we’ve forgotten how. Now we rely on doctors.” This mechanic knows we can heal ourselves. Many of us know that. Yet the current medical system often denies us that experience by suppressing symptoms. Instead, we can acknowledge and team up with the body’s innate healing capacity to invite and stimulate the body to truly heal. If you’d like to truly release some area of pain along with pain relief, and/or explore a non-Western approach to re-establish your innate healing, please be in touch by email or phone. * If any medical doctors or nurse practitioners are reading this and want to learn more about bodywork for pain relief and truly healing pain, please do be in touch with me!